Everyone loves a good conspiracy theory. This is very obvious from the number of articles and posts on the net speculating on how Ross Brawn reached his decision to be employed by Honda instead of Ferrari. Reading them, I am led by turns to think Brawn a Machiavellian genius, an infallible prophet, a wise old uncle and a puppet master extraordinaire. To have concocted some of the schemes and intrigues now credited to him, he must have the calculating ability of Einstein, the vision into the future of Jules Verne, the manipulating talents of Svengali and the ambition of Charles Lindberg. For Pete's sake, the guy is basically an engineer. Okay, he has some reputation as a master of F1 strategy and he has the presence to command respect and obedience from the members of a racing team. But that's it; he does not have the power to predict the future, he is not in control of other men's destinies and he is not infallible. There is no reason to suppose that the facts surrounding his switch from one team to another were other than those we have been told. Brawn's original decision to take a break from working with the Ferrari team was surely a natural result of Michael Schumacher's retirement and a desire to be home in England for a while to think things through. I see no reason to suppose that he was being dishonest in saying at the time that it was a sabbatical and that he would be returning to the company in a year's time. Brawn's later assurance that he would give Ferrari first option on his services when he returned was sincere too, although it was almost certainly prompted by the suspicion that he would not be wanted by then. 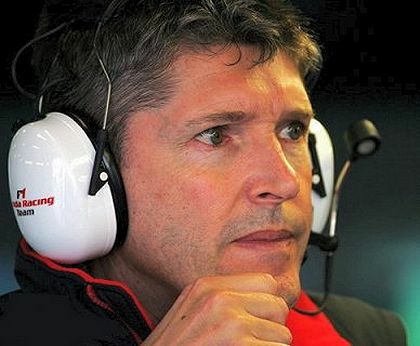 He is no fool and must have watched the reshuffle of the Ferrari squad with increasing conviction that the job he wanted would not be for sale at the end of the year. The matter of giving Ferrari first chance at him was, no doubt, the product of his loyalty to the company and a desire to do things in the right way. So, when Nick Fry came calling in the depths of his despair over a season that had gone hopelessly wrong, I'm sure Ross made him no promises. It would have been silly to burn any bridges until the situation with Ferrari had become definite, however, and Ross must have hinted at least that, if the Honda offer remained open and Ferrari proved unwilling to accommodate him, he would be interested. He would have kept the possibility of working for other teams open, of course; there was always a chance that a really fascinating opportunity might crop up. No doubt other teams did make approaches to him that we have not heard of. But I believe Brawn when he says that the Honda job offered the greatest challenge and so became the preferred option. With Benetton and Ferrari, he has twice taken on such challenges and won; there is no reason to suppose that he would not relish the thought of doing it a third time. Honda have managed to get themselves into a terrible mess but they have the resources to recover, if properly guided. So it would not have taken long for Ross to decide on Honda after having been through the expected run around with Ferrari. And that is all there is to it, I'm sure - pretty much what Ross has been saying, although he is more diplomatic about Italian business practices than I am. But all this supposition about Stepney's involvement and dark hints buried in apparently inoffensive statements on F1 matters is just a desire for more drama than exists, I think. Brawn is a very straight-talking guy and either says what he thinks or keeps quiet. And I cannot see him deliberately manipulating people in the way required by some of the theories I have read in the last twenty-four hours or so. Get over it guys - he caught you napping. You did not see it coming because you were not looking for the obvious and there is no sense in assuming some deep, nefarious plan just because you had not expected this! Of course, if you'd been reading my blog, you'd have known all about it a year ago. I admit that I thought he would go to McLaren, rather than Honda, but I told you he would not be returning to Ferrari. Brawn has said that he can make Button as fast as Hamilton - really? I, personally, have big doubts about that. Undoubtedly Button is a big talent but I believe he has some way to go to have the impact Hamilton has had. OK Button has been around longer but to be truly the best you need that extra mental edge and while Hamilton has it, I would question whether Button can step up and find that tiny bit extra required, even with Brawn's guidance. Well, I hope that Button finally delivers on the promise he's shown all these years. And I guess, if anyone can can bring that out of him, it has to be Brawn. He'll never have the impact of Hamilton, however - it's too late for that. Just to add to this discussion on Button....Is Button a WDC material? Hell yeah in my opinion....Is he a Michael Schumacher, Ayrton Senna? Hell no....He, to me strikes as a could be champion in the Damon Hill, Mika Hakkinen mould. Not being a Michael Schumacher takes nothing away from their achievements and so shall it be for Button i hope. Great stuff! When I heard the news I found myself wondering what the paddock would do with a resurgent Honda, Brawn at the (technical) helm. He'll provide some much needed steel in the team (Button and Fry being just too nice). It was a surprise move that I was not expecting - I thought he would retire for good - but it has some Schumacher-esque overtones to it. A failing team, chance to turn it around and be the hero. Although Honda have not had the years of failure that Ferrari endured, Honda Racing headquarters can't have been a pleasant place to be this season. They need dragging back towards the top, kicking and screaming, and Brawn may be the man to do it. I can see the attractions for Brawn. The challenge is one, and maybe the lack of drama another. It doesn't surprise me. The surprise was the rumour floating by Brazil that he was headed for Ferrari when Todt leaves. I guess alot of people just wanted it to be so. As you pointed out, the new Honda design has to be pretty well locked in so that actually buys him a half season of minimal pressure (if there is such a thing in F1). He's got a pretty hefty team building window, there. Unless the car is an absolute mess, I think we may notice some improvement early on but I'm waiting for the mid to latter part of the season. This could really put Toyota on the rack. It will be nice to see the guy back on our screens every couple of weeks - Honda have underachieved on the whole, but if anyone can turn them around it would appear Brawn is that man. On the Button front, he has been around too long to have an impact like Hamilton - but that's not what Ross promised, he just said he could make Button as fast as Hamilton, which with the right car isn't an impossible task. I would still like to see Alonso and Brawn team up - but not necessarily at the expense of Rubens' career. Which would be tricky!